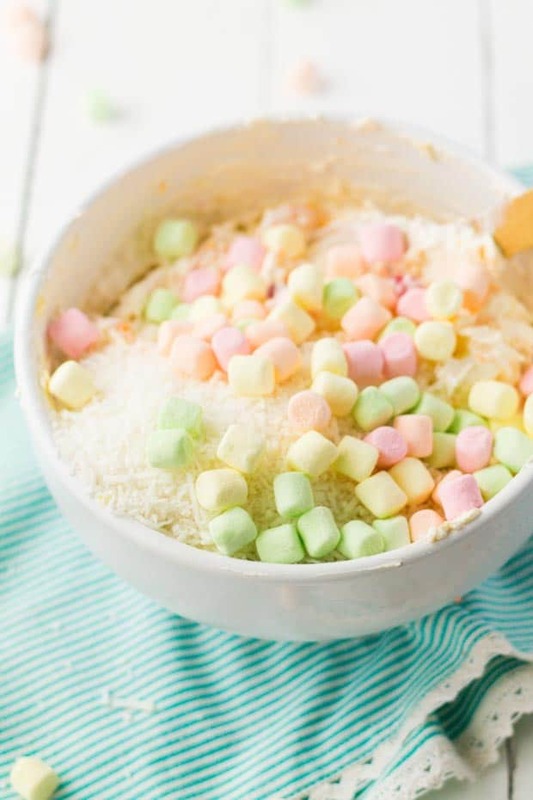 A classic fluff salad, this simple, classic ambrosia salad recipe is packed with pineapple, mandarin oranges, coconut and miniature marshmallows. This recipe was a staple in my grandmother’s traditional Southern kitchen. This simple homemade treat comes together quick and easy. It’s fun to serve for a snack, treat or to take along with you to a potluck. No one can say no to this light, fluffy, yummy treat. Many of my favorite recipes come from my Nannie’s recipe box. She has many delicious recipes that our whole family enjoys. 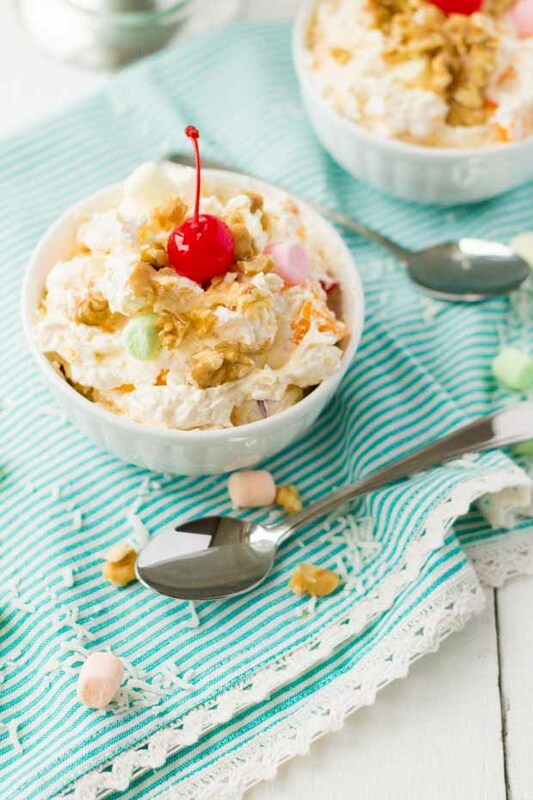 Like the ambrosia salad we’re talking about today. Ambrosia is a variation of a traditional fruit salad. Most ambrosia recipes contain pineapple, mandarin oranges, coconut and miniature marshmallows. Some identify it as a Southern treat. I identify it as incredibly delicious and I’m sure after one bite, you’ll agree. I love how simple this treat is to put together. It only takes a few minutes and my guys love to help me with it. In a large bowl, cream the cream cheese on low until smooth. Then add the whipped topping, a third at a time, mixing on low speed. Stir in oranges, pineapple, cherries, coconut and marshmallows. Spoon into serving bowl and garnish with chopped walnuts and cherries. My boys sometimes prefer me to leave off the walnuts. I’ve also used slivered almonds before and they were good as well. If you don’t eat all the salad in one serving, just scoop into an airtight container and store in the fridge. It’ll last for a few days. I love how colorful it looks in the serving glasses. Light, fluffy and flavorful. And those cherries! Such beautiful bursts of color and yumminess on top. 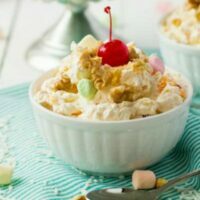 I suggest you make this ambrosia salad to enjoy with your family soon… you won’t be disappointed. 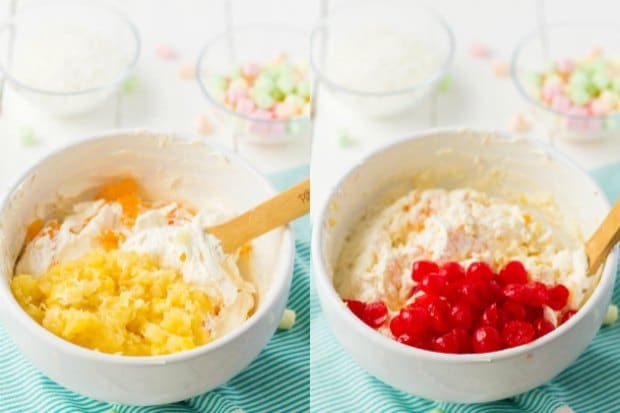 Enjoy this easy Ambrosia Salad that is both colorful and delicious! In a large bowl, cream the cream cheese on low until smooth. Add the whipped topping, a third at a time, mixing on low speed. Stir in oranges, pineapple, cherries, coconut and marshmallows. Spoon into serving bowl and garnish with chopped walnuts and cherries. 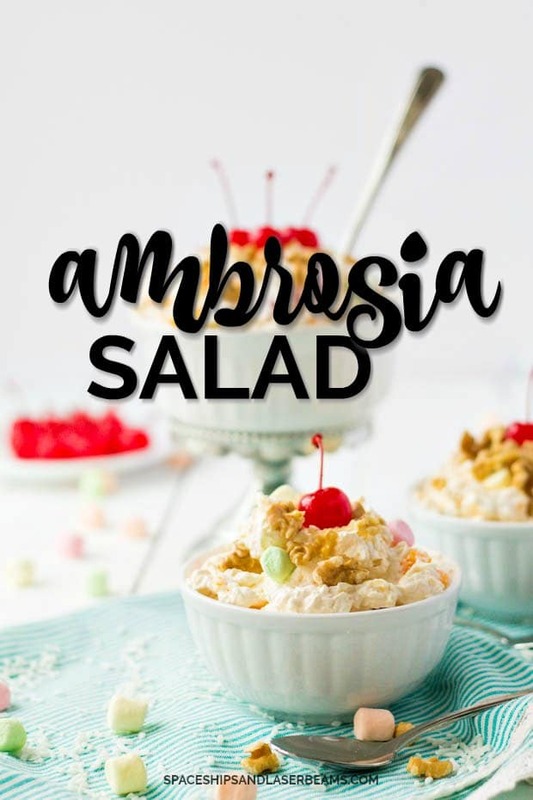 This Ambrosia salad is the best I have ever had! It is simple to make. My family enjoyed this Ambrosia salad!